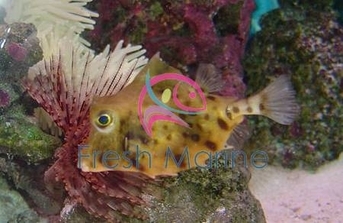 https://sep.yimg.com/ay/yhst-33477391359232/camel-cowfish-tetrasomus-gibbosus-7.jpgCamel Cowfish - Tetrasomus gibbosus Expert Only!!! Not Cover Under Arrive GuaranteedPeaceful70 Gallon4 inchesYes, with CautionOmnivore, BrineIndo-PacificOstraciidaeSmall 1" - 2"
Referred to by many names, including Helmet Cowfish, Thornback, Thornbacked Boxfish, Cowfish Helmet, and Hovercraft Boxfish, the Camel Cowfish requires the care of an experienced aquarist. The Camel Cowfish has a rather drab, pale tan body with random blotches of blue and occasional black dots. The eyes are large and blue. The Camel Cowfish should have a minimum of an 70-gallon tank. Use caution if placing it in a reef tank as it will often nibble at tubeworms. When stressed, the Camel Cowfish releases a poisonous substance, called ostracitoxin, from its mucous glands which will kill other fish in the tank very quickly. Very little success has been achieved in breeding this fish in an aquarium. When introduced into a tank, the Camel Cowfish can be fed a diet of live brine shrimp or bloodworms. After acclimatization, chopped squid, clams, mussels, and herbivore preparations can be fed. This fish has the peculiar habit of coming to the surface and spitting when it is hungry. Difficult to keep in capitivity. Unlike the Long Horned Cowfish, the Camel Cowfish is not as widely known with Aquarists as it is rarely imported in any large numbers making this fish a somewhat rare. Those who have aquired this fish though, love it for its adaptability and hardiness. Like its cousins, the Camel Cowfish should not be kept with aggressive or fast moving fishes. It is also suggested not to place this fish in a tank that houses any cleaner type fish, as they may injure the fish. The Camel Cowfish should not be kept with other Boxfish, as they can be territorial, as well. This fish can emit a toxin if it dies that may kill fish in your tank. Keep plenty of carbon on hand to use in case of death. Carbon filtration and large water changes should keep any disaster from happening. Maximum Size: The Camel Cowfish Grow upto 4 inches in length. Camel Cowfish will learn to swim near the surface and spit water as a form of begging at feeding time. This begging behavior, though cute and charming, should be discouraged as it may swallow air and cause buoyancy problems.